This brief article is actually the summation of considerable thought and reflects many elements that I covered in my last two pieces (5 Themes from a Chief Data Officer Forum and 5 More Themes from a Chief Data Officer Forum), in particular both the triangle I used as my previous Data Management visualisation and Peter Aiken’s original version, which he kindly allowed me to reproduce on this site (see here for more information about Peter). What I began to think about was that both of these earlier exhibits (and indeed many that I have seen pertaining to Data Management and Data Governance) suggest that the discipline forms a solid foundation upon which other areas are built. 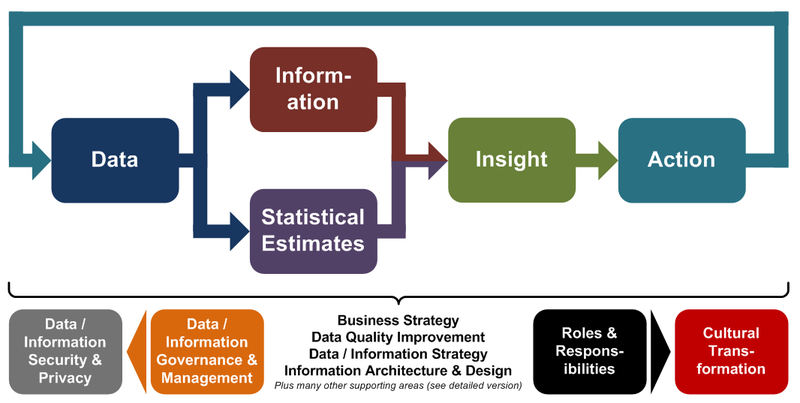 While there is a lot of truth in this view, I have come round to thinking that Data Management may alternatively be thought of as actively taking part in a more dynamic process; specifically the same iterative journey from Data to Information to Insight to Action and back to Data again that I have referenced here several times before. I have looked to combine both the static, foundational elements of Data Management and the dynamic, process-centric ones in the diagram presented at the top of this article; a more detailed and annotated version of which is available to download as a PDF via the link above. I have also introduced the alternative path from Data to Insight; the one that passes through Statistical Analysis. Data Management is equally critical to the success of this type of approach. I believe that the schematic suggests some of the fluidity that is a major part of effective Data Management in my experience. I also hope that the exhibit supports my assertion that Data Management is not an end in itself, but instead needs to be considered in terms of the outputs that it helps to generate. Pristine data is of little use to an organisation if it is not then exploited to form insights and drive actions. As ever, this need to drive action necessitates a focus on cultural transformation, an area that is covered in many other parts of this site. This diagram also calls to mind the subject of where and how the roles of Chief Analytics Officer and Chief Data Officer intersect and whether indeed these should be separate roles at all. These are questions to which – as promised on several previous occasions – I will return to in future articles. For now, maybe my schematic can give some data and information practitioners a different way to view their craft and the contributions that it can make to organisational success.